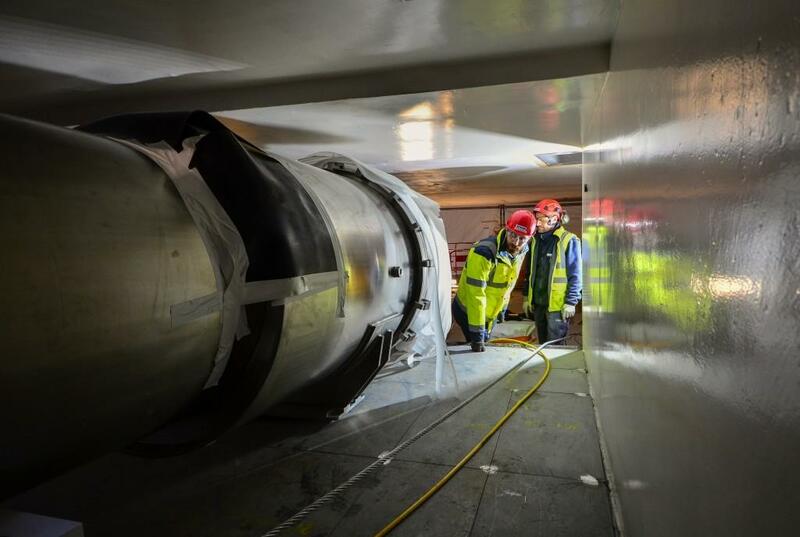 A cryostat feedthrough delivered by the Chinese Domestic Agency has become the first metal component of the machine to be installed in the Tokamak Pit, in an operation orchestrated over two weeks by the ITER Organization. An activity that began with the transfer of the component to the vicinity of the Tokamak Complex—and that was pursued as the 10-metre, 6.6-tonne component was introduced into the Pit through an opening in the bioshield roof—has now been concluded through the final positioning of the feeder segment in the building. Final adjustments were performed through metrology measurements to fall within +/- 2 mm with respect to the Tokamak Global Coordinate System. 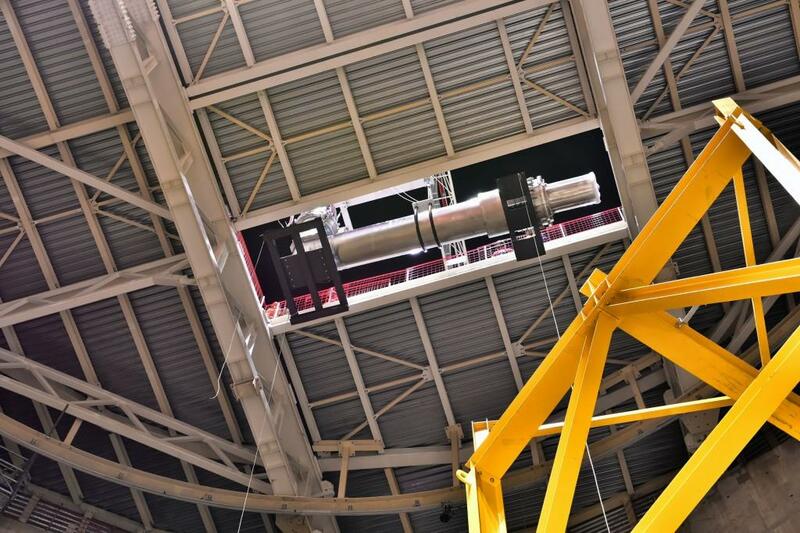 If magnet feeders are the essential lifelines of the ITER magnets—carrying electricity, cryogenic fluids and instrumentation cables—"feedthroughs" are the part of the feeder assemblies that cross through the bioshield and the cryostat. 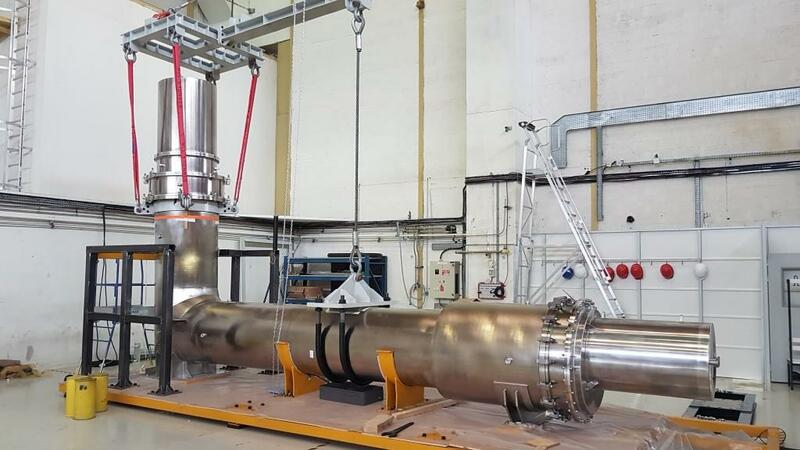 This first completed unit had been delivered last year to the Magnet Infrastructure Facilities for ITER (MIFI) where, as a first-of-a-kind component, it underwent high-voltage tests, leak tests and endoscopic inspection. 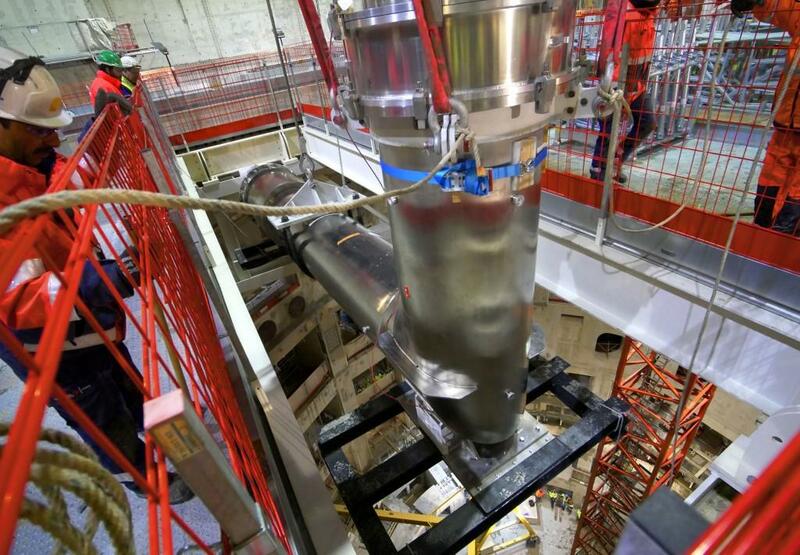 Ultimately, the feedthrough will be joined by two other components—an in-cryostat feeder (nearest the vacuum vessel) and a coil termination box (outside the bioshield)—to connect to poloidal field coil #4, one of the two largest of the machine's six poloidal field coils (24 metres in diameter). 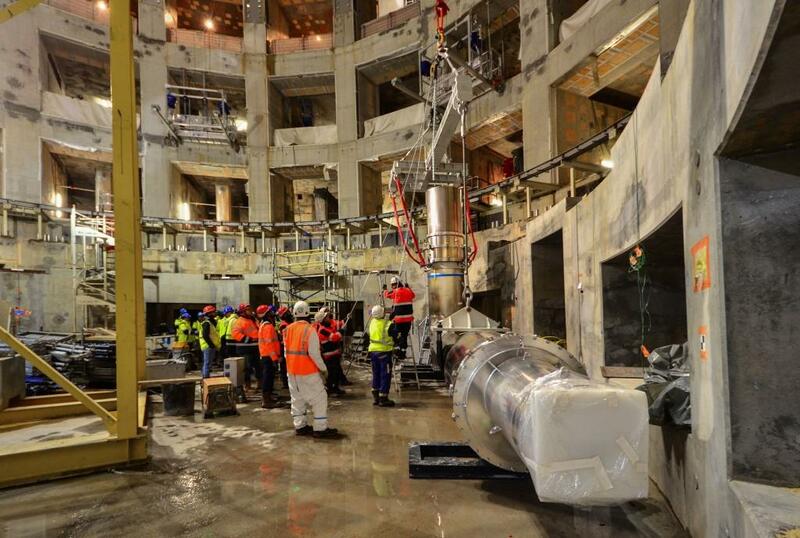 "A large number of actors played a critical role in the installation operation that concluded last week," notes Bruno Levesy, Group Leader of the In-Cryostat Assembly Section, with satisfaction, "The Domestic Agencies of China (fabrication) and Korea (tooling), the ITER Organization logistics provider DAHER (transport), European Domestic Agency building contractors, ITER's Construction Management-as-Agent contractor, and the French company CNIM (which won the early works contract in the Tokamak Pit) all participated." Giobatta Lanfranco (Construction Team) and Bruno were the most involved staff members of the ITER Organization. "It has been a good practice in coordination for the many activities to come." 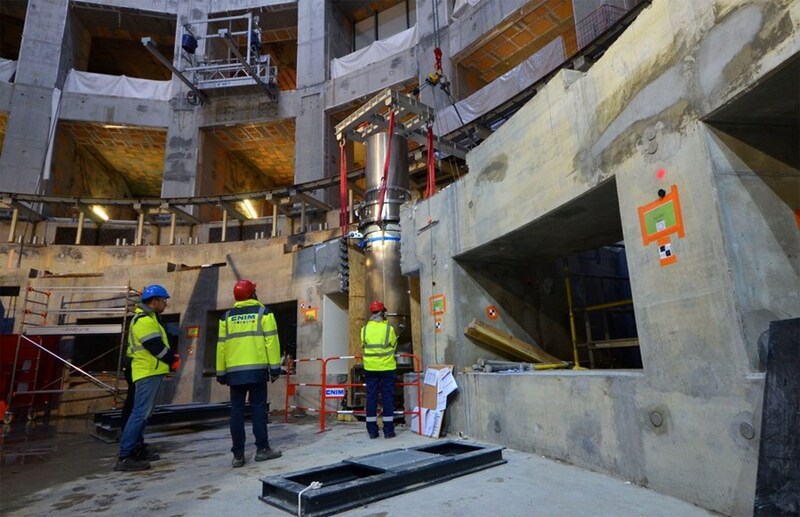 The lift operation was practiced in advance at the MIFI Magnet Infrastructure Facilities for ITER, using lifting tooling procured by the Korean Domestic Agency. At MIFI, the first cryostat feedthrough delivered by the Chinese Domestic Agency had been tested and inspected. 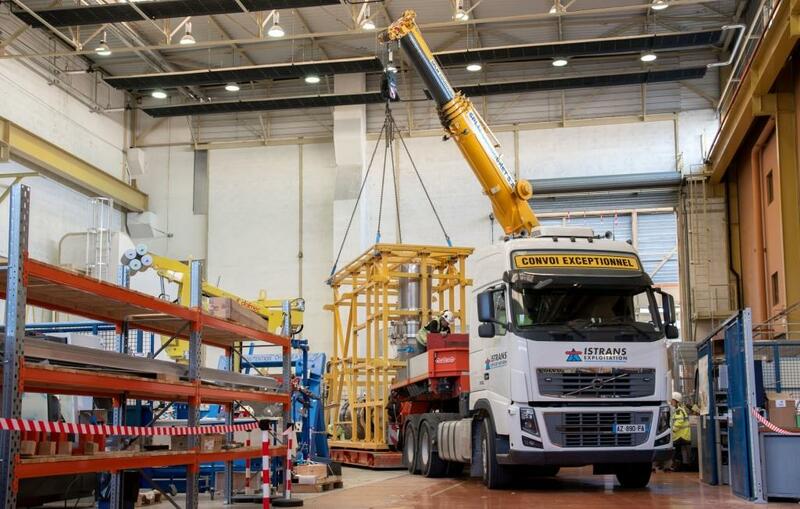 On 19 November, the component was transferred by truck to a storage facility on the ITER site. One week later, the weather was right for an out-of-doors operation: the delivery of the component from temporary storage to the Hot Cell Facility area (used currently as a staging area). 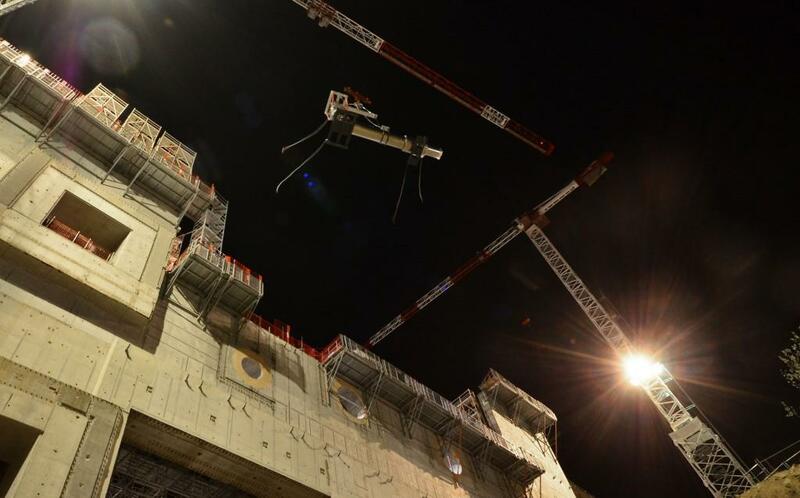 The Sun had just set on the ITER worksite when the big, shiny stainless-steel component was slowly lifted to the third level of the Tokamak Building (L3). 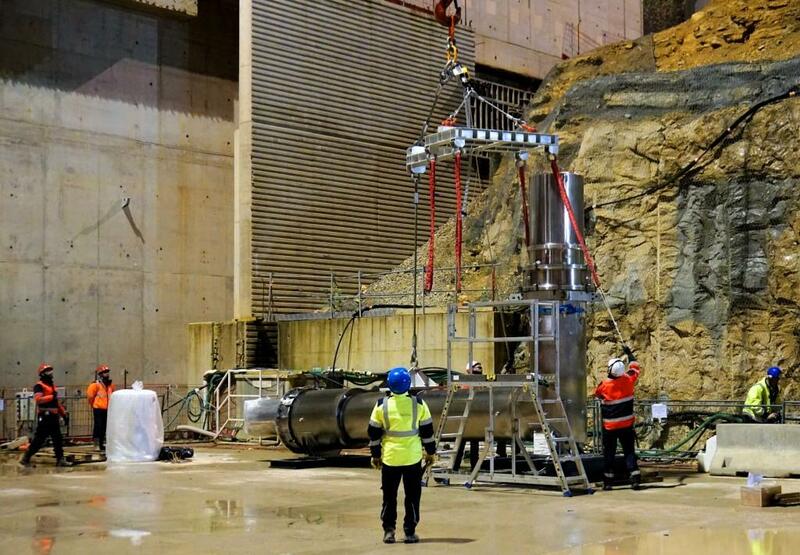 From the top of the Tokamak Building, the 10-metre, 6.6-tonne component was slowly lowered into the Tokamak Pit through an opening in the temporary roof of the bioshield. The team was carefully coordinated by the ITER Organization. The opening is barely large enough to allow the passage of the component. After a successful lowering operation, the component was temporarily protected. On 6 December the final positioning activities were carried out.